EtBr and UV have been used in laboratories for techniques such as agarose gel electrophoresis. However, it has been shown that EtBr is potential mutagen. Also, UV can damage DNA sample and UV radiation is harmful. NaBi is optimized for excitation of alternative reagent to EtBr with 470nm Blue LED replacing UV light. 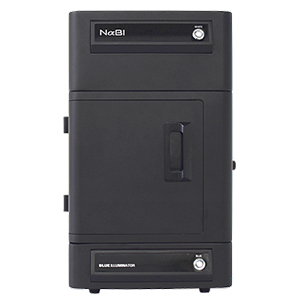 Its compact size helps make better use of a space in the laboratory. Also, the program has been designed considerably simple for ease of use.